thetrainline.com is the UK’s leading independent train ticket retailer. Our mobile app helps you check train times (updated throughout the day) and ticket prices as well as buy train tickets for all train companies to all national rail destinations. You can buy train tickets up to 10 minutes before you travel – and collect from over 1000 stations. •	Access train times information from the official national rail timetable (updated throughout the day). •	See recent and save favourite journeys making it easy to re-use common journeys and stations. •	See nearby stations in a list or on a map using your phone’s location services. •	View station information including ticket collection kiosk locations. •	View your ‘next train home’. The app finds the nearest station to your current location and lists departure times of the next trains to your home station. •	Buy right up until 10 minutes before boarding the train and collect from over 1000 stations. •	Create an account and book the same range of train tickets as on thetrainline.com website. •	Save your preferred payment card making it simple to buy train tickets without having to hunt out your card details. •	View ticket collection reference for tickets you’ve bought – regardless of whether you have a signal. 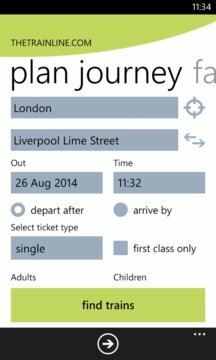 •	Access live departures and arrivals information including platform numbers from the official national rail timetable. •	View the live progress of your train and which stations it calls at. Includes any delay information and platform numbers.